When it comes to winners and losers in the digital age, one of the biggest potential winners is your construction quality control plan. As projects move from paper plans and drawings to digital and mobile, a digital quality program offers many benefits that can improve your QA/QC workflows and elevate your business as a whole. In this article, we’ve attempted to group them into five major categories: risk mitigation, improved quality and minimized rework, winning more business, operational excellence, and gaining insight with reporting and analytics. A general contractor’s primary goal is to minimize risk. One of the most best ways to mitigate risk is by ensuring your team is building off the most up-to-date set of information. 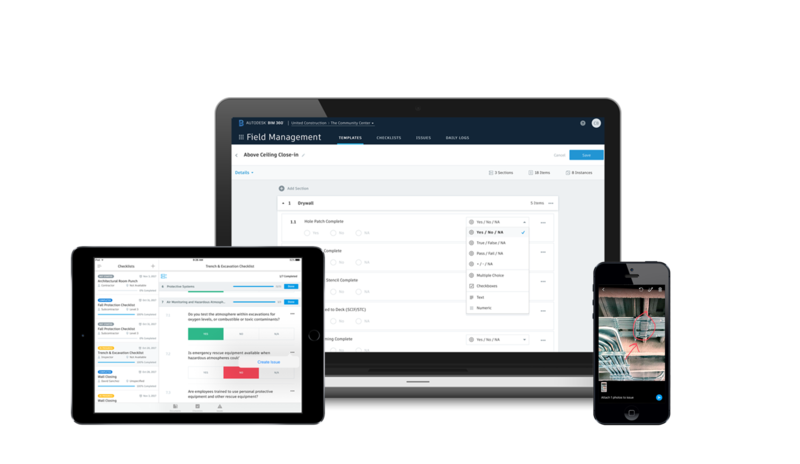 A digital document management platform such as Autodesk BIM 360 Docs solves this problem by linking the office and field through real-time communication and document exchange. Using a digital document management solution ensures field workers not only have the ability to access up-to-date drawings and models on site, but can go a step farther by providing both 2D and 3D views that bring fine points of detail into vivid realism. Workers can see the precise location of a required action, along with all its measurements, materials descriptions, and any advisory notes concerning estimated time required and appropriate technique for spec implementation. When a change is made, the entire project team is notified in real time, allowing them to comment on or question any points that require further clarification. With delays in communication virtually eliminated, the end result can be fewer RFIs and increased accuracy of work done on-site. This ultimately lowers risk and frees up more time that can be used driving the project toward completion. Adopting technology to digitize your quality program helps you standardize processes and reduce rework. For example, teams can proactively manage quality across the project by completing inspections with digital checklists. Digital checklists provide ease in documenting all conforming inspection points, in addition to non-conforming issues. With Autodesk BIM 360 Build teams can easily create checklist templates to drive conformance in how you execute your quality program, regardless of who is doing the inspection. Assign checklists to team members to perform from any device in the field; add notes, attach photos, or for any non-conforming items, easily create issues directly from the checklist and assign them to the subcontractor building clear accountability to ensure a quick resolution. A digital quality program allows you to improve the visibility of your inspection and test plan (ITP) to whichever project stakeholders you see fit. Many contractors have reported improved relationships with their clients by providing visibility into the inspections being performed on their projects, putting the number of deficiencies identified in context. Based on the project complexity, having a dozen unresolved defects or non-conformance issues might sound negative but if your client sees that you inspected 30 areas of work last week and made over a thousand quality observations, then within that context, twelve nonconforming items is very manageable, and shows the teams dedication to maintaining high-quality standards. A digital quality program improves operational excellence by enhancing a company internally from its people, processes, and relationships with third parties. The most important asset any construction company has is its people, along with their collective knowledge and experience. A digital quality program gives an organization the ability to capture best practices and expertise of its most experienced teammates in the form of a checklist that can be carried forward on future projects. To empower your third party relationships involve your trades and subcontractors when building out your checklist to improve alignment and set expectations. This will reduce the number of non-conformances and resultant re-inspection efforts required. One of the largest benefits of a digitized quality program utilizing a common data platform is that all your data is centralized and can surface insights into project and program performance, arming your team with the knowledge to make more informed decisions on a daily basis. With a digital quality program, you can learn from the past so that you can better prepare for the future. Three of the most common metrics for quality programs are coverage, conformance rate, and subcontractor scoring. Coverage is a measure of the number of inspections or quality observations performed. By monitoring this, you have a way to better understand your level of risk or exposure on the project. Conformance rate is a measurement of the percentage of work performed correctly upon initial installation. You can review this by inspection type to understand which areas of work or inspection procedures produced the highest or lowest conformance, which help you understand subcontractor performance and areas for improvement. Subcontractor scoring is a way of measuring subcontractor performance, giving you an opportunity to identify and help struggling subcontractors improve, as well as giving you more information when you’re selecting your team for the next project. We recommend putting together a subcontractor scorecard system, which can become more advanced as your digital quality program evolves. In addition to these three metrics, instituting a root cause reporting system is key. This is a way to understand issues and solve them at their root cause, creating a feedback loop of continual improvement. 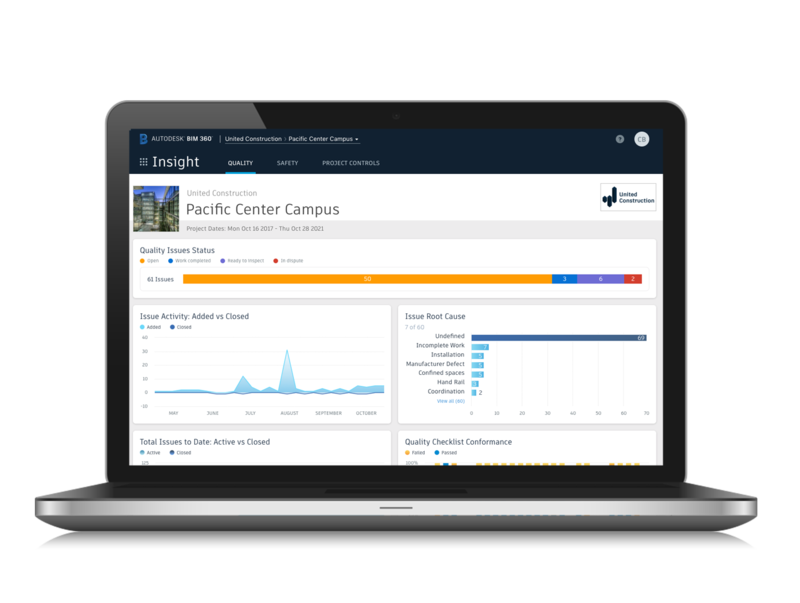 With BIM 360 Insight project teams can easily view quality, safety and project control trends. Implementing a digital quality program brings excellent benefits. By digitizing processes and capturing the knowledge of your team, you can learn from the past so that you can better arm yourself for the future. Download your free digital quality management toolkit.